The Club House was opened in February 1909 as a centre for the industrial classes. The subscription was 2d a week. Behind the building were three tennis courts, a croquet lawn and a bowling green. lnside the building were three billiard tables in the games room, a gymnasium, a smoking lounge with newspapers and periodicals, a reading room with a library, a large and a small hall and a small business room. Membership was open to all those over the age of 18, if approved by the committee. There was a resident caretaker and the club went fiom strength to strength until the Great War. From 1916 until 1920 the Club House became "The Garden Suburb Auxiliary Military Hospital". lt was a centre for the resetting of badly set broken bones and under the leadership of Dr. Stedman helped by Mrs. Irwin, Mrs. Carter Bell and a staff of doctors and nurses 1700 servicemen were treated without a lost of life. Two temporary wooden buildings were added to the site which enabled 60 patients to be resident at any one time. After the war Hampstead Tenants Ltd. allowed a new company to run the Club House, the Hampstead Garden Suburb Club Ltd. The club prospered and became a social centre for the old part of the Suburb. My parents-in-law held their wedding reception there on the fifth of December 1931. All these things came to an end in 1940 when a landmine exploded on Willifield Green and wrecked the building. When peace came Copartnership Tenants Ltd. disclaimed the lease they held. The war damage compensation was retained by the Trust Board who allowed half the site to be occupied by a new house built in an uncharacteristic style to the rest of the green. For seventeen years the rest of the site remained unused until 1957 went Princess Margaret cut the first sod to commence the building Fellowship House. a pale shadow of it's predecessor. The other card is no. 141 by Gordon Smith. 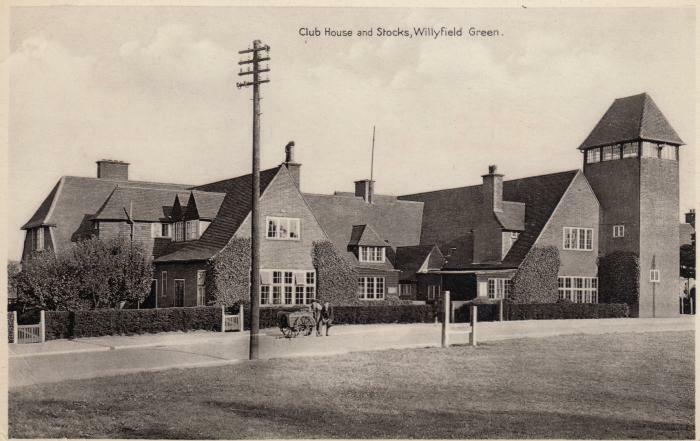 There are a number of postcards depicting the Club House including two publishers showing The Garden Suburb Auxiliary Military Hospital. The first series are published by Langfier Ltd.343, Finchley Road N. W. whose cards are real photographs. The second series has no name but has the same reverse design as used on cards published by M/s W. T. Pike & Co. 19, Grand Parade, Brighton with the same picture format on the front. These cards appear to be taken from the same plates as those used for the Langfier cards but, they are not real photographs.